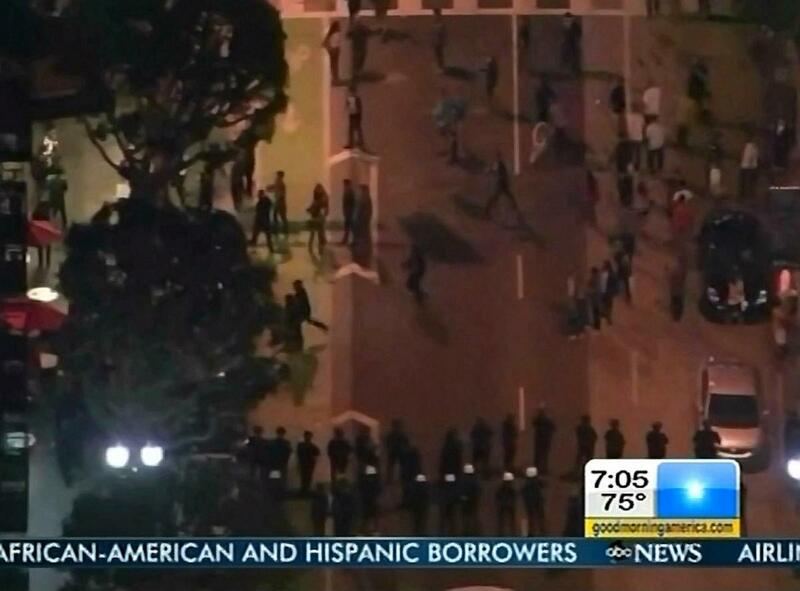 Occupy violence erupted in Los Angeles on Thursday with protesters using slogans such as "Kill the cops." NBC skipped the story on Friday's Today. CBS This Morning and ABC's Good Morning America offered a combined 31 seconds. GMA news reader Amy Robach explained that police had to break up a crowd of "200 angry protesters." She briefly added, "It started when Occupy L.A. activists joined a street art event and then taunted police by drawing chalk pigs and slogans like 'Kill the cops.'" One police officer was injured and a dozen people were arrested. CBS This Morning offered even less information, allowing a mere seven seconds out of two hours. Each day, CBS plays a video montage of assorted journalists discussing the latest news events. On Friday, an unidentified voice quickly recounted, "A massive protest in downtown Los Angeles - at least one officer was injured. The protest appears to be linked to Occupy L.A."
Today, despite its four hour running time, avoided the story. The show's hosts did find space for a hidden camera expose on dishonest carnival games. Journalists have consistently underplayed Occupy violence. That could have something to do with how excitedly reporters hyped the movement's potential, a contrast to their treatment of the Tea Party. "Good evening. We begin tonight with what has become by any measure a pretty massive protest movement. While it goes by the official name 'Occupy Wall Street,' it has spread steadily and far beyond Wall Street, and it could well turn out to be the protest of this current era." — Anchor Brian Williams leading off the October 5, 2011 NBC Nightly News. "We're here, just a few blocks from Wall Street. I mean, this is really the epicenter of what seems to have become a national movement....The marchers come from all walks of life, young and old, male and female, hoping their lawmakers are listening." — Correspondent Bigad Shaban on CBS's The Early Show, October 10, 2011. "This is a surprisingly functional little city. Let me give you a little tour. It starts here with the information desk for people newly arrived. Behind that this whole area back here, this is the media area. It's filled with bloggers and other people getting the word out and powered by donated generators. And this is the food station. It's all free and all donated — including some cookies that came in today from a grandmother in Idaho." — ABC's Dan Harris showing off the protesters' camp on World News, October 3, 2011. "The Occupy Wall Street protesters have set up a camp with a food court, newspaper, medical unit, Internet café — even yoga practice." — Correspondent Jim Axelrod on the October 10, 2011 CBS Evening News. AMY ROBACH: Well, in downtown Los Angeles last night, police in riot gear moved in to break up a crowd of about 200 angry protesters. It started when Occupy L.A. activists joined a street art event and then taunted police by drawing chalk pigs and slogans like "Kill the cops." It ended with at least one officer injured and a dozen people under arrest. UNIDENTIFIED MAN 1 (voice-over): A massive protest in downtown Los Angeles - at least one officer was injured. The protest appears to be linked to Occupy L.A.